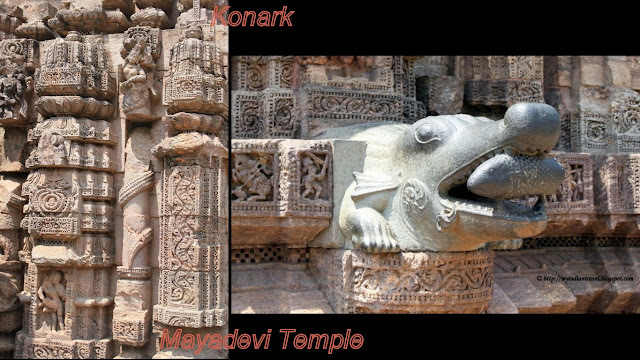 In Konarak, the Sun Temple Complex has few more temples other than the main Sun Temple. The notable among them is to the west of the main temple popularly called Mayadevi Temple. Built in 11th century AD, the temple facing east comprises of sanctum and a porch standing over a raised platform. The top portion of the sanctum and porch are missing. It is believed to have been dedicated to one of the wives of Lord Surya. However, the image of Sun God in the temple indicates that it may be a temple built earlier than main temple. The interior of the porch is notable for their beautiful sculptural work. On the external side the temple exhibits lot of sculptural marvels. One of the interesting sculpture is that of a crocodile. Another fascinating temple with such a rich history! The places you show us are so beautiful! The frieze carvings are exquisite and in surprisingly good condition. Hello, wonderful tour and photos of temple. I like the image of the Sun God! Have a happy week ahead! Correct me if I'm wrong, but crocodiles are not frequently seen on any temple designs. What makes it part of this one? Such intricate carving .,, and then the crocodile too! He looks like he is eating a rock! What an impressive temple, even if some of it is missing. The crocodile sculpture was a surprise and looks very realistic. I wonder what is he eating? What an artful stonework and a gorgeos building. Beautiful photos of your amazing temples with their intricate designs! LOVE that last pic, which I saw totally in a different way! Interesting temple site, wish it could have finished well! Impressive work on details and the croc with fish sculpture is quite an attract. Indeed beautiful and massive sculptural work! So lovely to have the chance to see it! Greetings! Another amazing structure that I'd like to see in person. sometimes I wonder how they were able to create those complicated works of art. Thank you for your beautiful photos! Fantastic shots.i have visited this place and when observing the works i was really surprised.